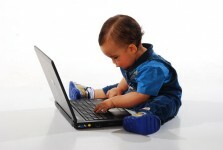 Curmudgucation: Should Your Three-Year-Old Attend On-line School? The short answer is, "No." Or maybe, "Hell, no." You may wonder why the subject even needs to be discussed, and the short answer to that is, "Because somebody's already doing it." By now you've probably heard the new old saying that kindergarten is the new first grade, with academic learning that used to be a staple of 6-year-olds now pushed down to 5-year-olds. We can blame that on many factors, including the parental desire to give their child an extra competitive edge, but arguably this is yet another problem we can blame on Common Core Standards. Some of the worst problems with the standards are found in the earliest grades, likely because of the use of backwards scaffolding-- the standards writers decided what a high school graduate should be able to do, and then just worked backward from there ("If we want them to bench-press 100 pounds in 12th grade, then we should start with 5-year-olds bench pressing 50 pounds and add 4 more pounds every year"). It seems logical, as long as I completely ignore the developmental capabilities of small children. The demands of the Core and Core-related testing has panicked many school districts into getting students started on academics sooner and ignoring what we know about the developmental capabilities of littles. Now we frequently hear noise about 5-year-olds not being ready for kindergarten, which has put the pressure on the Pre-K providers. In Florida, where huge numbers of littles are deemed "not ready for kindergarten," pre-K providers have been threatened with losing funding if their "graduates" can't pass a standardized kindergarten exam. This does not bode well for Utah Preparing Students Today for a Rewarding Tomorrow (UPSTART), an online Pre-K program that got its start from a federal grant that the state, which gave no funding to pre-K, gladly embraced. That was in 2015. A 2016 study found no real academic benefit from the program, but today UPSTART is still growing strong and pushing into seven other states, with grant money fueling a chance to extend their reach further. It promises that just fifteen minutes a day, five days a week will make your child ready for kindergarten. It makes other promises, such as being "easy for the child to use independently" which is an impressive claim for anything being used by a 4-year-old. It has been an oft-repeated item that the big guns in the tech industry raise their children tech-free (-ish). Recently, the New York Times ran a piece suggesting that the digital divide will not be between haves and have-nots, but between those the nonwealthy living screen-dominated lives and the wealthy who live screen-free. Groups like Defending the Early Years have come out strongly against cyber-school for littles, and nobody is writing stories about wealthy families pulling their children from tony Montessori schools in order to plunk them down in front of a computer. But as the reach of tech companies grows, software is seen as a cheap way to bolster education in poor communities. Are we moving toward a world in which the wealthy are taught by humans and the nonwealthy by screens? Stay tuned. In the meantime, we already know that the best, healthiest, most productive thing for pre-K children to be doing is play. And while something as simple as 15 minutes a day, five days a week may seem like no big deal, it normalizes computer time for children, gets families used to having data collected, pushes academics much too soon, and in return provides no proven benefits. Send your little to a play-based pre-school and leave the screen turned off.